"Now more than ever do I realize that I will never be content of a sedentary life on the surface, I will always be haunted by thoughts of being drenched elsewhere"…. Indeed, there are 101 ways of enjoying the wonders of Camiguin Island and maybe it would be too archaic to say I am one of many who are captivated by its enduring charms. I will never get tired of coming over and over again, last year I hopped to the island three times each with different agenda to relish once more its grandeur on its surface and beyond. Ferns & more foliage in the forest! White Island obscured yet like a gem in the blue sea! During one long weekend in summer I went with workmates to fulfill my long-time wish to climb Mt. Hibok-hibok, the trek was unforgiving but I made it traversing to Ardent Hotsprings. It was just marvelous getting up close with this majestic & dangerous mountain which have devastated the island decades ago. My legs went wobbly when I got back in the camp but happy for it was a wish come true! Mantigue Island, a gem in the Bohol Sea! I went back to the island for my year-end dive and the weather favoured us, while other regions was on a storm it was like summer in Northern Mindanao. We aimed for Mantigue Island, we just couldn’t get enough of the school of giant trevally and huge turtles. I never get tired of coming back again and again, the point is – we only spent brief moment underwater which is usually an hour at a time, and the probability that we will see everything in that moment is nonsensical. Exactly, different sightings in every descent. Yet if I’m in Mantigue waters, I waited for the turtles and the large herd of jackfish or trevallies. I wished to be in the midst of these numerous silvery fish with big eyes and swim with them or be engulfed in their swirling motion completely at peace. A throng of giant trevallies! Once again we encountered my favourite species – the turtles, giant trevallies, garden eels, stonefish, giant grouper (like a goliath! ), sea snake, moray eel, few nudis and unexpectedly – a herd of barracudas! We bumped with the trevallies at least three times as we went around. We stumbled upon a reef decorated with feather stars, soft and hard corals and hydroids formed like a heart – amazing discovery! 🙂 Angel tugged me and pointed it out while floating weightlessly. My two dives on that Saturday have refreshed me undoubtedly after just recovered from feeling ill. It was drizzling when we head for the white sandbar in Yumbing early the next morning, a storm darkened the skies followed by rains, but the sun peeped after awhile and suddenly brightened up the horizons. It’s been long since I last set foot in the sandbar, then a rainbow appeared and it reminded me of a promise from the heavens, a magic to behold sending good cheers! 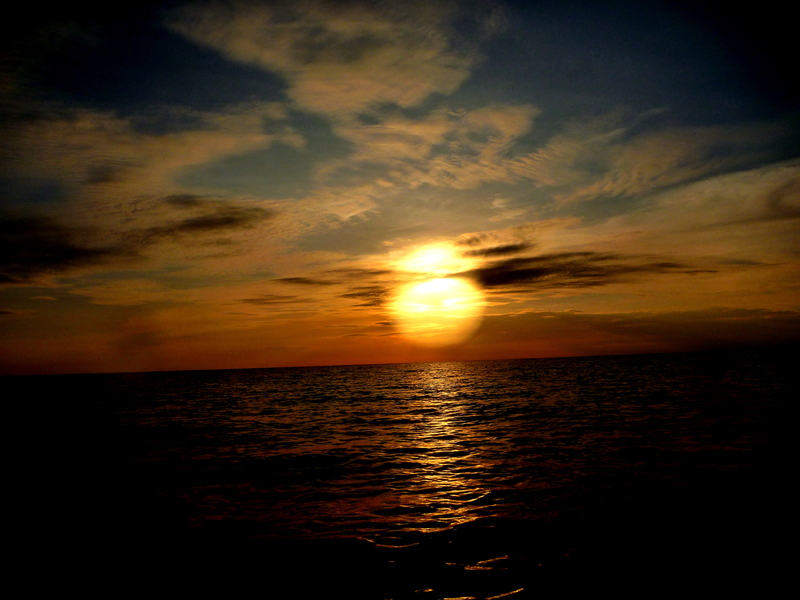 Camiguin always fascinates me in every way, the island is purely magical – surface and beyond. NB. 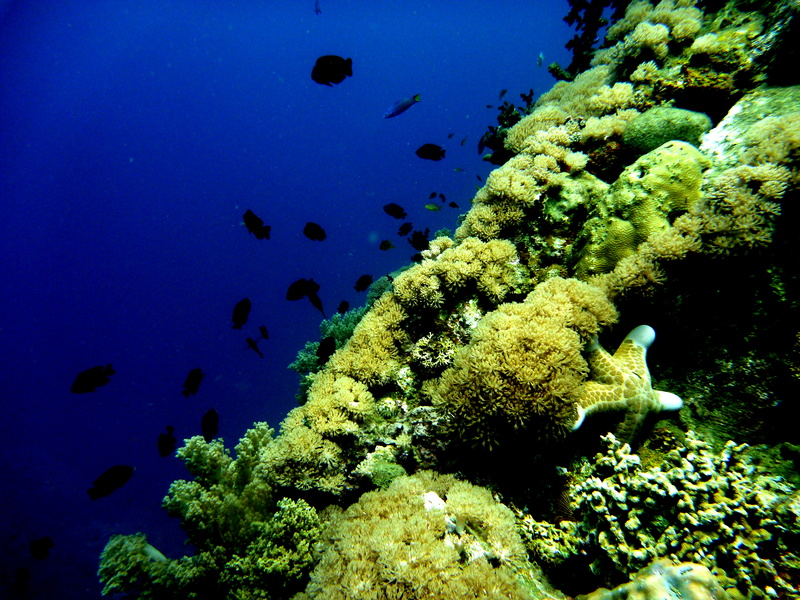 The split photo of Mantigue Island is courtesy of my dive buddy. The island-province of Camiguin is a pear-shaped volcanic island in the northern tip of Mindanao. It is approximately 90 kilometers north of the City of Cagayan de Oro. It is bounded to the north by Bohol Sea, to the west by Macajalar Bay, to the southeast by Gingoog Bay and to the east by Butuan Bay. This island paradise is inarguably my favorite local destination and as I said, it is so replete to cater for my whims and I have always reasons to be back again and again. My predilection on this island never wane a bit and last December I hit grounds to savor once again its grandeur. A weekend sojourn barely 32 hours yet it renewed my well-being enough to brace me for the year-end hullabaloo. If you are a diver and you haven’t explored the island’s underwater world, you have missed one psychedelic marine treasures and wonders. Luckily, all our transpo transfers went fluidly and we were already cruising at sunrise watching its golden splendor in the horizon. Our divemaster was already waiting for us when we got to our refuge in Agoho preparing our gears. The sun was perfectly shining and the water perfectly flat just waiting to be explored. Our first descent was at Old Vulcan, after cruising for thirty minutes. The familiar granite boulders decorating in its front. 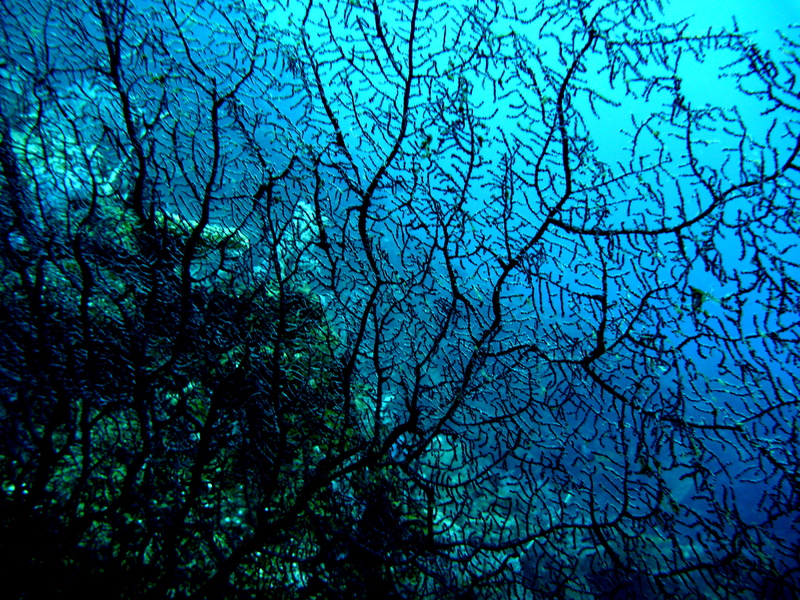 The large sea fans in variety of colors adorned the reefs, again I was engulfed in its vastness in a different world of silence. We sighted giant trevallies seven in all, there was even a tornado of snappers magnificently emphasized by surface sunlight. Indeed there was a variety of tropical fishes colorful enough for my senses – emperors, angelfish, moorish idol, butterfly, spadefish, fusiliers, shrimp fish and assortment of anemone fish. I didn’t miss the triggerfish, and also the turtle swimming away quickly! 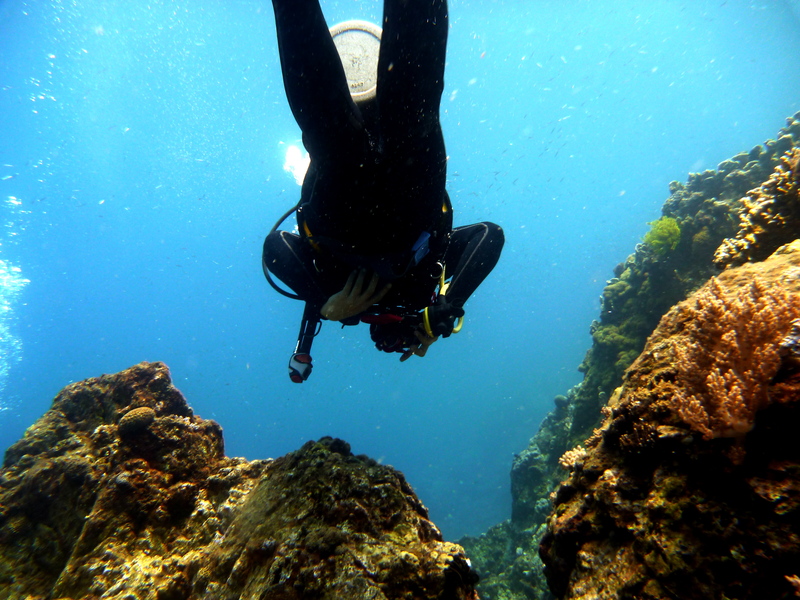 We linger in the large colorful coral area taking our time until we had our safety stop before the ascent. Giant clams scattered in the midst of corals! The necessary surface interval was another colorful encounter and it was like shooting two birds with one stone. 🙂 We cruise to the Sunken Cemetery being our next descent, and we swam comfortably towards the Cross marker. I have been wanting to step on the underwater cross marker just at the back of monument. We snorkeled the surrounding area, the wide coral gardens housed also the giant clams and juveniles. Such wonderful discovery! Perhaps just two of the underrated dive sites but always rich and hidden surprises abound. The next day was all riding our way to the two falls we have planned, but we attend mass first in Mambajao church. We dashed off after a hurried breakfast over a motorbike, the driver served as our tour guide as well. Katibawasan Falls is still beautiful but didn’t tried to swim, we feasted on the kiping instead. 🙂 Tuasan Falls was something new, it was a longer ride though, but the roads were completely paved up to the entrance. It is beautiful also, its catch basin was big enough as a pool, got a dip but didn’t linger long the waters was just too cold. But soaking in its cold natural waters watching the gushing waters was perfectly refreshing! Coming to Camiguin in December was an ideal year end get-away. We are coming back for a summer trip to explore off-beaten corners of the island. As I said, there is always a reason to be in Camiguin, again and again and again! Before my page would gather cobwebs, I am writing this account as we had finally explored the depths of main island Camiguin. We had our original schedule in May but chose over the transplantation works in the Linamon Project, catching the last Saturday of the month when my dive buddy came over. Now, I just thought it was an important moment, not only because we finally explored these coveted sites, it was the birthday trip of my favorite dive buddy! We did the usual routines on our weekend trips – Friday dinner, packing-up gears, four hours sleep, early bus drive and sleepy ride to the site. I was grateful our DM suggested for lodgings near the sites to save time and costs, it was comfortable enough and not costly. We took the jeepney from Benoni port to Mambajao as suggested again by our DM, than taking the costly motorbike ride, then finally took the tricycle to Barangay Agoho. We were bidding our time just like in our previous travels, just allowing things fell its place as it was still early. In our first descent, from Brgy. Yumbing, our boat brought us to Old Volcano site – the spot where the fierce eruption of the Vulcan transforming the island what it is now today. Navigating through blue waters against the green mountain ranges for about 30 minutes – it was an exclusive dive for us. The rustic Camiguin always fascinated me – it was pretty sunny and just perfect for the much needed dives, it’s been twelve weeks since our last dive! Back rolling for our first descent, the cold waters refreshed me from the “summer” heat. Agreeing to limit our depths to 35 meters, we didn’t waste time going down. 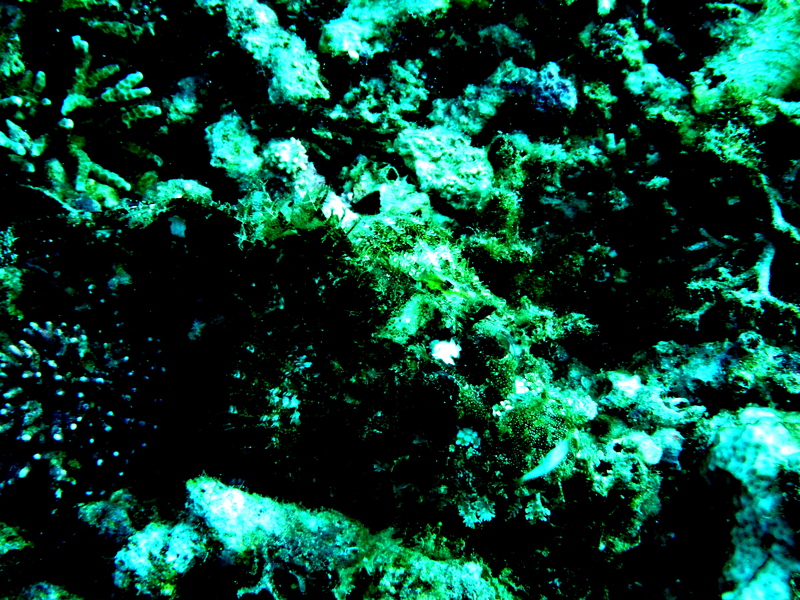 Boulders and lava rocks were visible though covered now with colorful corals and crinoids. We passed by in crevices, as if some kind of large cracks now covered with soft and hard corals plus variety of fish species claiming as their abode. There were sea fans in yellow, green and violet scattered in the area, one was so wide it obscured my way. Enjoying the rich diversity and making sure my buddy in sight, I inspected closely some crevices, then in complete surprise I saw the manta ray passing quickly away, but without missing its graceful flapping as in flying! Rare and wonderful. Angel and our DM was making signs and noticed it so late. Violet seafan – so wide! Our next descent was intriguing, I always enjoy unknown sites because there is much to explore and there is much to tell after the discovery. Sunken Cemetery has been a dream site – so near, yet so far. It was a sandy slope with more or less stable depth, never a drop-off, I guess cemeteries are normally plain. There were variety of corals in different shapes and colors, sponges, worms, crinoids and fishes – anthias, shrimpfish, lions, angels, bannerfish, snappers and more. 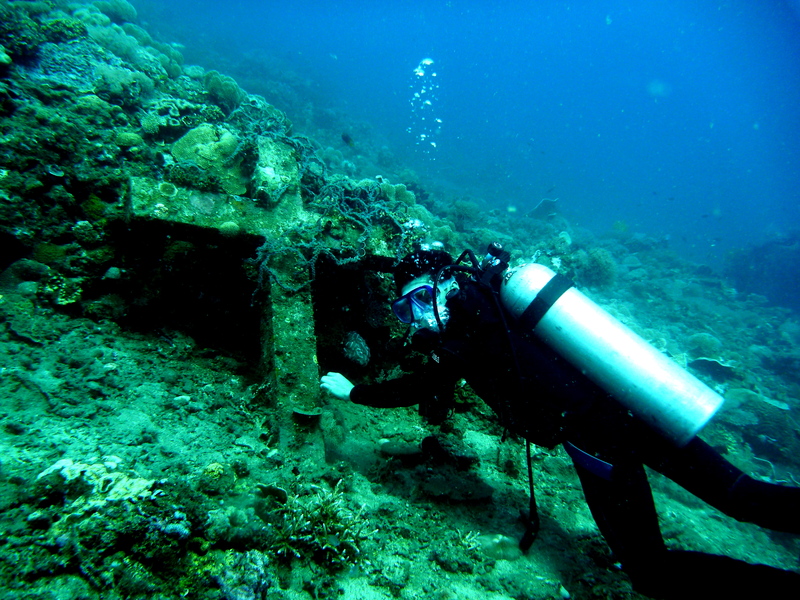 Indeed, we found the cross markers now tangled with corals, not only two but three – the last one was when we were about to have our safety stop! All of them almost buried with the corals on them. I was hoping to find skulls and bones, but it is impossible after two centuries of the eruption. Either the remains were deeply buried in the depths, or blown into pieces or swept away with tides and currents. The spot now has now turned into a marine paradise. Finally, the discovery after five years – of the ancient part of this island! I have to hold on with Angel to keep me steady during our safety stop perhaps I was already too famished to control my ascent. My favorite buddy always knew my need with just one look! Our late lunch at Terrasi served as our surface interval for our last dive. We quickly sailed for fifteen minutes to Black Forest, a sanctuary off the coast of White Island. The sand bar still with people, enjoying the mild afternoon sun. My first sighting as we got the depths was a handful of garden eels almost half up but as soon as I got near them, they quickly disappear. There was moray eel whose mouth and eyes closed, which I found unusual perhaps it was sleepy already. There were crinoids, worms, perennial lionfish, clownfish & anthias. We caught site too of few miniature nudis, cleaner shrimp lurking in the anemones and clams. There was stonefish too, and the friendly lowly turtle swam coyly before us – well, Angel chased it again for photos! We surfaced after 54 minutes with my air still at 1200 psi. An afterglow after our third dive! Lacking sleep the dives sapped my energy but the three wonderful dives made me smile as I drift off to sleep. The Island Born of Fire is truly magical and I will always love this paradise. I have more than hundred reasons to come here again and again and again. Marvel at the Giant… on Albay Waters by Chance! "In nature, nothing exists alone." ~Rachel Carson~ If we do not act now, extinction may be humanity's most enduring legacy. We must work together now to protect endangered and threatened species. Everyday is Earth Day! "Those who hope in the Lord shall renew their strength..."